Humans and chimpanzees share up to 99% of the same DNA, which is particularly remarkable considering we don't look anything like each other. The reason behind our vast difference in appearance is all thanks to our seemingly useless so-called "junk" DNA. These days, junk DNA is more accurately referred to as noncoding DNA. These sequences were once dismissed as pointless because they had no obvious biological function and didn't code protein sequences — meaning they didn't directly affect how an organism's genes are expressed. But they can have an indirect influence, and researchers at Georgia Tech believe noncoding DNA is responsible for why humans and chimps look so different. While most of the human and chimp DNA sequences are identical, there are some "gaps" in the genomes near key genes that can affect how these genes are expressed. These gaps are created through the insertion and deletion of junk DNA sequences known as retrotransposons, and these can effectively turn parts of the genome on or off. The retrotransposons in humans and chimps behave very differently, which makes two otherwise extremely similar genomes create two species that look almost nothing alike. "These genetic gaps have primarily been caused by the activity of retroviral-like transposable element sequences. Transposable elements were once considered 'junk DNA' with little or no function. 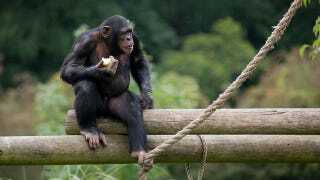 Now it appears that they may be one of the major reasons why we are so different from chimpanzees. Our findings are generally consistent with the notion that the morphological and behavioral differences between humans and chimpanzees are predominately due to differences in the regulation of genes rather than to differences in the sequence of the genes themselves." Via Mobile DNA. Image by wwarby on Flickr.